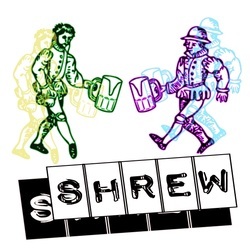 Shakespeare BASH'd presented The Taming of the Shrew, Shakespeare’s rambunctious, farcical, and controversial comedy about courtship, marriage, and love at the 2012 Toronto Fringe. The stage was set for the original battle of the sexes, but in the end did love triumph? The company's inagural production at Victory Cafe was a Fringe hit, being awarded the honour of Best of Fringe and receiving a remount at the Toronto Centre for the Arts. The production also won the My Entertainment World award for Best Fringe/Summerworks/Showcase/Cabaret Production of 2012.